It is with incredible sadness that I am writing to let you know that our beloved Chrissie has passed on. It has been just over 7 years since we adopted her, and she brought us joy every day that she was with us. I initially contacted you after our previous golden died. Just a few short weeks after we lost Barney, my mom suffered a stroke and I was looking for a companion for her while I was at work. I recall the application process like it was yesterday, and remember being promised that because of our special needs your volunteers would keep an eye out for the right dog for us. I confess that at the time I wasn't sure what to expect, or if I'd ever hear from you. A few short months later I received a phone call about Crystal Bella, a 6-7 year old female who had just lost her 90 something year old owner - she was in need of a quieter home and was great with an older owner. without her! She loved the drive to Hilton Head - she visited relatives, she stayed in hotels, she got to walk on the beach alongside the dolphins. Two years ago, I retired and Chris was in her glory - no more having to go in the yard during the day .... whenever she had to go, it was a trip to the park stopping to visit with the neighbors. Amazingly she continued to wake me at 6 every morning but would let me go back to sleep once I told her there was no work that day. Chrissie slowed down quite a bit over the past year and x-rays showed that there was disc and nerve damage, but she kept on going just at a slower pace. We made it to last year's reunion and it was a great day. Unfortunately, our lives changed later that week as my mom suffered another stroke, and this one far worse that the first. Her prognosis wasn't good, and after 2 weeks in the hospital she was moved to a nursing home. Fortunately, they had a policy that allowed pet visits and when Chris arrived my mom spoke for the first time since the stroke. Seven weeks later, mom returned home to 'her' girl � Chrissie was able to get to her when no one else was able. At night, Chris slept on the couch in the room with my mom and would come and wake me if she stirred. She would keep a close watch as various aides came in to care for mom, and if Chris didn't like them everyone knew it and they didn't last long. During this time especially, I was consulting with our vet as Chrissie was keeping my mom going. Then the past few weeks Chrissie started having other health problems as well. The vet told me that Chris would let me know when it was time, and last Thursday morning she did - it was the first morning in 7 years that she didn't stick her nose in my face wake me, and when she finally made it into the room, she didn't come near me. She laid down on the far side of the room. She didn't want to go out, and she wouldn't cuddle and I knew something was up ..... mention the phrase 'lets go out' and she smiled, and as for cuddling, Chris treated every day like it was a training day for the annual kissing contest - she practiced washing my face daily every day but last Thursday. It's going to take some time to adjust to life without Chrissie .... but after we mourn our loss, I'll be submitting another adoption application. Adopting Chris was the smartest thing I've ever done. In spite of the pain that we're suffering now, she brought us 7 years of joy and a lifetime of happy memories. Please accept the enclosed donation in memory of our beloved Chrissie; she was a very special addition to our family and passing has left a huge void in our lives. While one day there will be another golden, there will never be another Chris. Pat, our condolences to you and your mom�we know how special Chrissie was to you both. Thank you so much for your generous donation. Here are a few photos of our beloved Boomer. As you can see, he loves to spend time relaxing with his "brothers" Bailey & Petey (as well as his "sister" Sabrina - not in picture) and had a ball playing in the snow this past winter. He is an energetic, lovable, sweetheart that melts everyone that meets him. Boomer is happiest spending time cuddling up next to his family - 4 legged or 2 legged members! Thanks for the photos�he�s absolutely adorable! This card is sooooo Amber! I�m not sure she even sees her food. Thank you for the card � gave me a laugh. When I walk her she likes to smell all kinds of things. I let her do it for a while at the beginning of the walk, but then it�s exercise time. Often she will be so intent on smelling that she just stops, sits and refuses to move along. Cracks me up every time. I cajole her to continue, talk to her, whatever � she�s too much of a senior citizen to get mad at and pull along. She always continues and I kind of like the fact that she�ll take a stand on something as she�s such a beta dog 99% of the time. Hope you are well and that your canines and felines are staying away from the vet ($$$)! Thank you for the mother's day wishes. Hope you had a great day, too. I have been thinking about you and your puppies. Hope everything is good. Here are a couple of recent pictures. Apollo, Tanner, Savannah & Gracie. Tanner and Savannah are litter mates. He is one good lookin� dude! Thanks for your card - it prompted me to give you an update on Chewey. We have been in Atlanta for a year and he is doing very well. He still has his charming, humorous personality but thanks to some obedience training he is a gentleman (most of the time). We live in a condo complex and I walk him off leash in our dog walk area, and he will listen to me, despite most distractions. 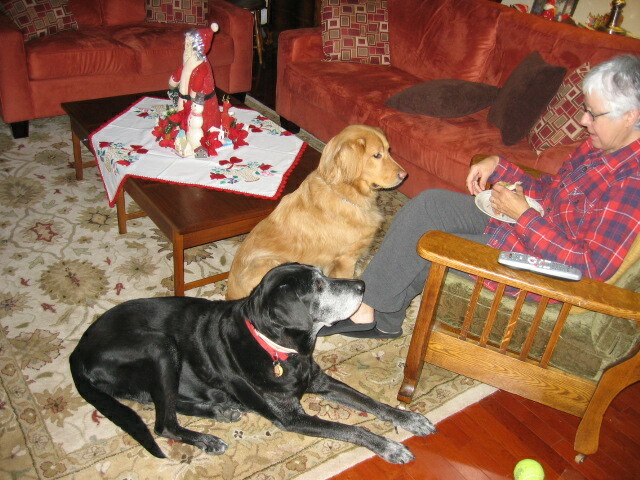 I have attached 2 pictures of Chewey and Guiness (my son's 15+ year old black Lab who is now living with us since November). They get along well - Chewey enjoys the company. Thanks again allowing us to add him to our family. Thanks for the update and photos. We�re happy that Chewey has a brother to play with now! I confess, given the information about separation anxiety I was concerned especially since mom had another stroke just hours after Riley was here - just 6 hours after she got home I spent hours in the ER and at the hospital, but a neighbor ran in a few times and I was able to run home to walk/ play with her - other than 1 accident and 1 stolen Kaiser roll everything has been fine ever since.....I really think that she's home already! I read the information in her binder and hoped to follow some of the 'ease her into your life' instructions but life got in the way and Riley has risen to the occasion amazingly! She's met most of the neighbors (and already found the people with the treats), has buddied up with Chrissie's old friends (including her boyfriend, a 12-year-old German Shepherd named Jake), has been to the park a dozen times and walked for miles and slept in bed with me (she didn't move around much at all), gone for car rides and to the store (and waited patiently while I picked up dinner) but most importantly, this afternoon we were in the park meeting Jake and a little boy was running around with his mom. Thomas seemed to have some sort of affliction (I'm not sure if it's autism or some other problem), but he wanted to pet the dogs....the mom asked if it was ok and I shortened the leash up and said yes and Riley walked over slowly (she does nothing slowly) and stood still so Thomas could pet her, then she sat down for more. Then she laid down so he could rub her belly - they she sat up and kissed his hand - his mom was almost in tears and so was I - Riley is wonderful! Riley is just what I need right now too! She's had me laughing and kept me playing instead of worrying and dwelling on a situation that is out of my control......she has already destroyed a tennis ball, peeling the skin and then popping the ball.......the plush toy that she found she carries in her mouth and chews on but so far it�s still intact. We�re thrilled that things are working out with you and Riley. 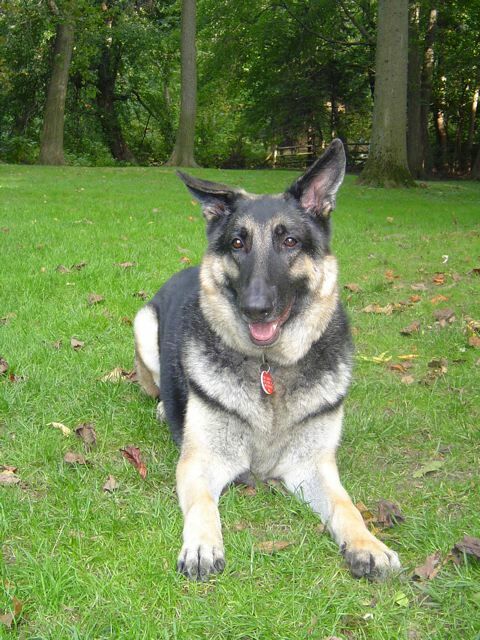 She�s going to be a wonderful therapy dog for your mom and is just what the doctor ordered! With great sadness, I must tell you that Air (adopted as Wilson) has lost his battle to cancer. We had just celebrated his 1 year anniversary with us when he was diagnosed with a brain tumor. It was such a short time with him but he knew how to live life! What a blast we had with him. Thank you for bringing us together. Marie & Rich, we�re so sorry to hear about Air. You�re right, your time together was too short; that�s always the risk one takes when you adopt a senior. But we can�t tell you how grateful we are that people like you are in this world and understand how absolutely wonderful senior goldens are. Our prayers are with you. Harriett is doing great. She loves swimming, playing fetch, and is alternating on which kid�s bed she sleeps in. And the little dog follows her around everywhere. Love her to death; couldn�t be happier. Thanks again! Thanks for the adoption manual and dog id tags. They just arrived. Here are a couple more pictures. Wow, we�re having fun. Just wanted to drop you a line to let you know how Holly is doing and how happy we are that we adopted her. 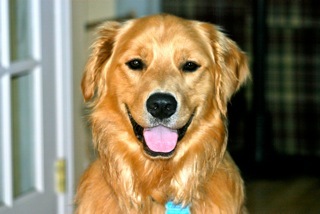 She is such a happy and lovable dog and is our constant companion. 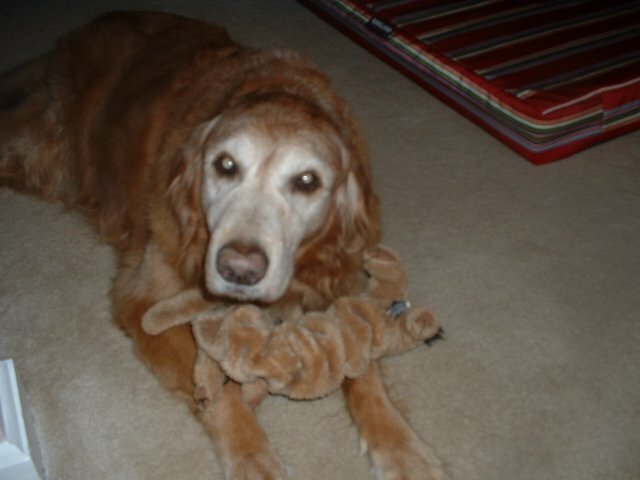 It was a tough fall for all of us as we lost Sundance, our other golden and Holly�s best friend. She has adjusted well to being the only dog in our home and I think she really appreciates all of the extra love she is getting as we deal with our loss. 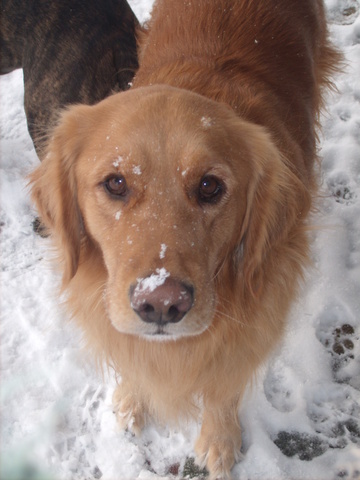 Holly�s favorite thing to do is play fetch with her ball, play in the snow, and visit the chickens in our coop. She wants to be anywhere we are. She loves when our granddaughters come to visit and is gentle and loving with them. Could it be that little hands like to feed dogs cookies? She is healthy and happy at almost 10 years of age now. 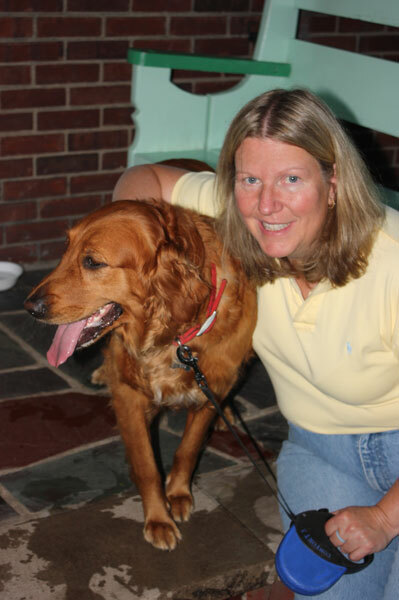 We are enjoying every moment with her in her golden years and just want to thank you for all of your dedication and efforts to provide great goldens to families like ours. Yay for Holly. 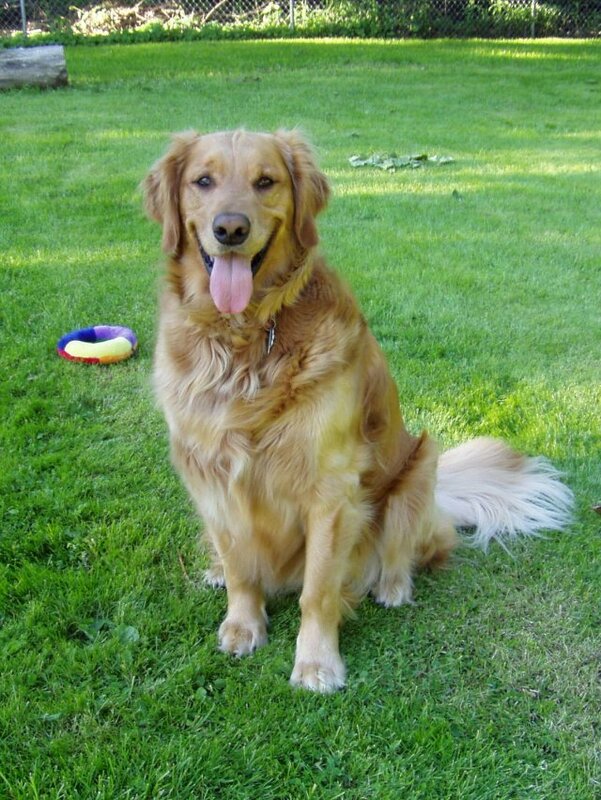 We�re always happy to hear that our goldens are happy and healthy in their forever homes. We are so happy to have Marshall. What a loyal and devoted dog! He's so gentle but yet boy does he love to rough house! He's had a couple of health issues but his prognosis is good and he's doing great. We're looking forward to a long healthy life with him! Hi Mary, we also hope that you all have a long, happy life together. Charlie was adopted July 13, 2008. He is such a great dog. He's so loving and sweet. Charlie is good with people and our other goldens. He loves to go for walks no matter what the weather. All he ever wants is love. I can't believe we got such a great dog. Thanks for the update and the photos. He looks wonderful. I am sad to inform you that Dr. Watson passed away on June 10, 2010. He was the greatest dog I have ever owned. Enclosed please find an update on both dogs. He enjoyed about 9-1/2 years with us and passed away from kidney failure. Shirley Holmes is doing great. We are so grateful to have had him in our lives. I am going to forward some photos we had of him and Shirley Holmes in Maine on one of our vacations. 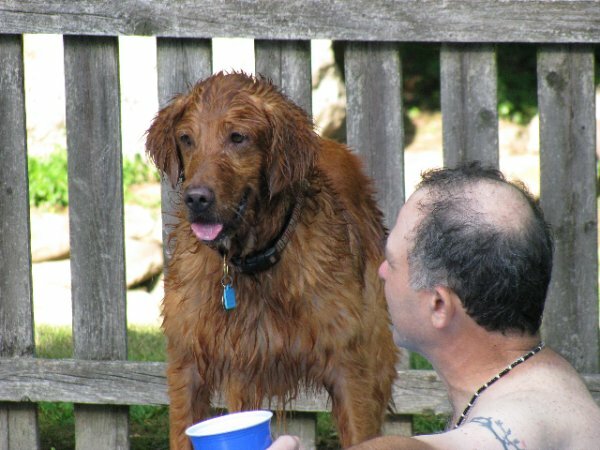 He was a great swimmer and loved to go into the pool every day. He loved the lakes and streams in Rangeley, Maine. He was loved and will be missed greatly. Thank you for the work that you do. Oh no, Rich & Julie, we�re so sorry to hear about Dr. Watson�s demise. Please know you�re all in our prayers. We love the names that you selected for your dogs! When you�re ready, we�d love to help you adopt Moriarity! Mac is 7 months and 72 lbs.....not an ounce of fat on him. He eats like a pig. Belle has been on a diet for months and she still isn't losing weight. Poor Belle, typical woman, can't shed a pound. I took her in to the vet last week for a thyroid panel to see if that was the problem. And you know Belle, she so hates the car and we were hoping that was the worst of our outing. We got to the vet and they had had an emergency so the waiting room was packed. The critters weren't the problem...it was a lady with a puppy and 3 little kids....terrible toddlers as Belle would say. And to make matters worse - they had the ceiling fans on! To Belle, the second scariest thing in the world to basketballs is ceiling fans. Poor girl. She immediately crawled under a chair for the wait. The waiting room of the vets office is floor to ceiling windows looking out three side of the building. Next door to the vet is a daycare with lots of farm animals. Two roosters,two very large roosters, had taken to pecking for food right outside the window - Belle spied the roosters, up came her head - she'd remember "Oh no, the ceiling fans" and down she'd duck only to pop up again to look at the roosters outside the window. It was a good distraction and she was quit comical. The vet called me Tuesday about her blood work - "Bingo! It is her thyroid." Now she is on meds for hypo-thyroid and the vet thinks she will lose weight quickly and I won't have to stress about her diet as she should be able to eat what a normal dog eats. I only started her meds on Tuesday so we need to give it some time and I take her back in a few weeks for follow-up blood work. The vet agreed that she needs either first appointment of the day or after lunch so she will not have too much stress during her visits. My Brave Belle. The funny thing is when she is home, in the house or yard, you would never know she has these fears. There are moments when there is a loud bang or God forbid it's windy outside that her past creeps in to haunt her - but for the most part she is a happy, funny dog who loves me [ : ) ] and pushes Mac away so she can get her fair share of attention and let him know "She's mine!". Remember when I first brought her home and she was so terrified of going upstairs? She hasn't quite mastered the fear yet but lately when everyone goes to bed, she will come upstairs ...."Hey, where'd everybody go?" Of course, Mac is always thrilled to see her and jumps up with a bone to greet her..."Wanna play, Belle? Yay, you're here!" and then they proceed to play...only problem is - it's midnight! So I jump out of bed shushing them so Matt doesn't wake up. LOL She still won't sleep up there but one of these days I think she'll surprise me. Ya never know. My Nicky graduated from eighth grade Thursday night and when we came home from graduation - Mac had diarrhea. All night long I stayed up with him and in the morning (before he even ate breakfast) he started throwing up water. I texted the vet as I was really scared.....the bottom line and $500+ later - he may have eaten a mushroom or something toxic in the backyard. I never let them out without me but you know how fast they are. Belle really isn't interested in anything but sticks. Mac is still interested in tasting the delicacies of the world! He is feeling a million times better today, not 100%, but on his way. I was worried that he swallowed something, although he isn't a chewer of things not his - you never know. The x-rays showed nothing (phew) and they called me today that the blood work was good.....so he's on antibiotics. He got a full blood workup, x-rays, shot of Cerenium to stop the vomiting, an intravenous hydration pack and meds to go. $800 on the two dogs in 8 days........good thing they make credit cards! LOL I'm just glad that everything is okay. I hate worrying about them....as you well know what that feels like. She follows me everywhere as does Mac so I have these two giant fluff balls as my tail at all times. OH, I almost forgot. Mac is taller than Belle - she's a shorty anyway. They always come and sit in the kitchen during dinner...wherever the good smells are, they will come. Mac is so tall now that he can sit and look ON the table - he can see everything up there. When we are eating, he just sits and looks and Belle dances around trying to get a glimpse of "What the hell is that that smells so darn good?" It is hysterical because he gives her looks like "Aw, it's just pizza, nothing for you." Too funny. For mother's day I made my Mom a lobster and Belle went nuts for the smell. We have never seen her be so bold at the dinner table where she actually put her nose on the table - she' got good taste! Photos......I put captions in to self explain each one. She is a character, Judy, a real character. When you look at the photos, they do tell a story. She is stubborn and funny. My sweet girl who refuses to do a self portrait with me...see for yourself! I hope you are well.....your babies up there....Jack?....Daisy? I think about you often and am always grateful that Belle came into the "real" world through your wonderful care. hugs to you.....and then more hugs from Belle and some for Jack and Daisy. Nancy, Brave Belle, and Little Bro Mac. As always, thanks for the enlightening emails! A great big thank you to everyone at GRRINJ for helping Chase (a.k.a. 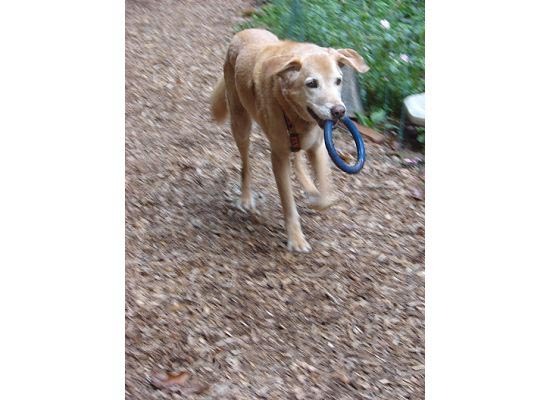 "Flit") find his way to his furever home with our golden gang! 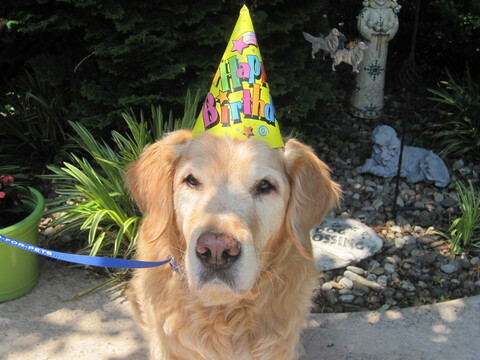 Tomorrow is Chase's official "Sweet 16" so we thought we'd share this birthday photo with all of you! Happy, happy birthday to our sweet, wonderful boy! Hope all is well with you. We are doing good. 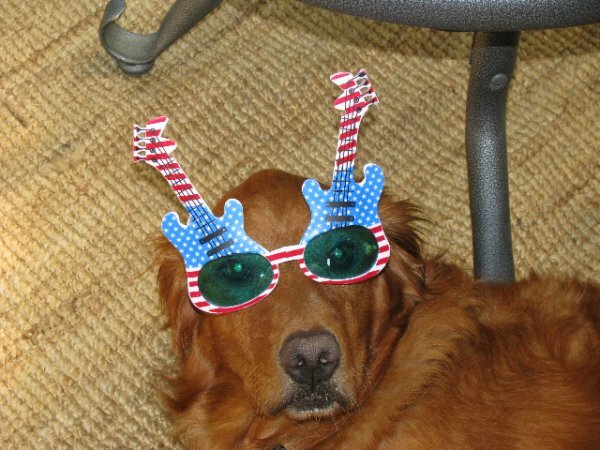 I am sending you some pictures of Trevor celebrating the 4th of July. It was his first party and he had a great time swimming, and playing, and hanging out. We had about 20 people over and he was perfect. He absolutely loves kids and he can't stop swimming!! The only thing he didn't like were the fireworks. He did good though, he went inside with some of us and laid low. He is definitely afraid of thunder and fireworks. He is not destructive he just sits by us and shakes. Poor guy! We are still working on his behavior with other dogs, he is doing much better we even had him walking with another small dog and they posed for a picture without any drama!!! Next week end we are going to introduce him to his cousin ( Kevin's sister's dog Jack). See you at the picnic!!! Trevor looks like he was the life of the party! Friday night Frank and I sent Cookie to the Bridge. She came home that afternoon after she seemed much better and her oncologist said she might do better at home, went down to the grass to potty, came in and just lay down by the door. It rapidly became obvious that she was getting weaker, and when even Gorgonzola cheese would not spark any interest in her, we took her back to her oncologist and sent her to the Bridge. Cookie was not a RAG dog. She came to us six years ago at age six in New Jersey while we were still snowbirds. She came from GRRI-NJ and had been turned in to the pound after giving birth for the umpteenth time. She belonged to people who were probably back yard breeders. She had perfect house manners and always came when called. 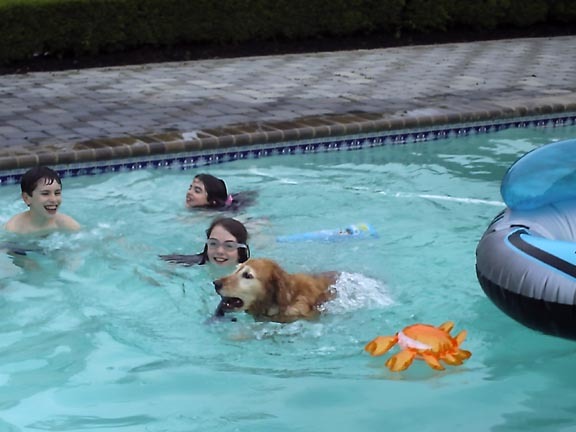 Frank had always wanted a dog who would swim with him, and when we took Cookie into our pool enclosure back in Jersey, she sat by the pool looking alternately at us and at the pool, so we said OK and she jumped in. Her favorite activity was to dive off of the diving board, which she did with skill and grace. When we sold our Jersey house, we bought our current house for Cookie as the townhouse we had did not allow dogs in the pool. She came with us when we went back to look at houses a second time, and decided that this was the house for her. When she wanted to swim she would throw her ball in the pool and then wait for the OK to retrieve it. She knew she couldn't go in with her collar on. She did get grouchy and protective in her old age, but prior to that, she was a therapy dog who worked with Alzheimer and memory impaired patients in a day care unit back in Jersey. On the way in, she didn't want anyone to stop her for pets - she wanted to get to her people. On the way out, it was a different matter. Cookie was a case of foster failure. When we went to pick her up from the volunteer who sprung her from the pound, she ran to Frank and put her head in his lap, and that was that. 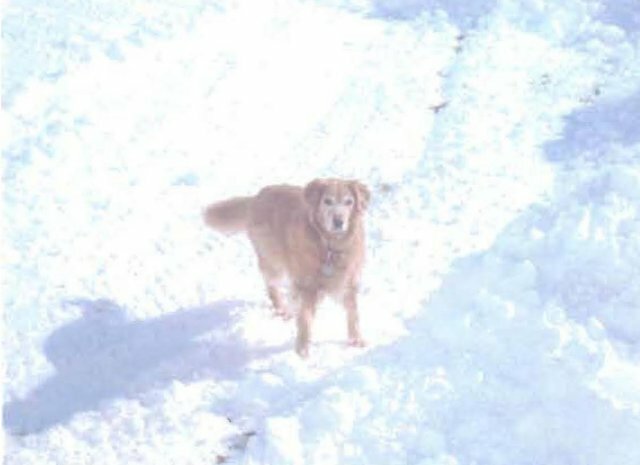 Having ascertained that she loved car rides (remember, we were snowbirds and had to drive cross country to get out here), she was ours forever. When Frank had cancer, she tried not to leave his side. 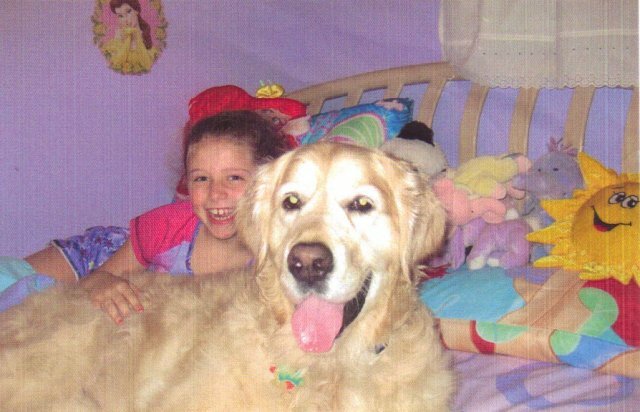 When we asked at Sloan-Kettering if we could bring her in to see him when he was hospitalized, they were horrified, even though she was a Delta therapy dog. I heard recently that they now do allow therapy dogs in the hospital. Frank always says that he would not have made it without her. When she got cancer, we tried to give her the same absolute love she had given Frank. Since you all have been requesting a pool social, as soon as we feel up to it, there will be a "Cookie Finkenberg Memorial Pool Party" at our house for you all and your dogs. Details will follow. Right now, there's a huge hole in our hearts, but hopefully it will ease somewhat with time and the love of our Roxie, right now our own personal therapy dog. Thank you all for your prayers and support while Cookie was being treated for her two forms of cancer. It really helped to have the support of people who have been there and survived. We�re so sorry to hear about Cookie. May wonderful memories of your time together bring you comfort. Just wanted to give you an update on Benjamin. He is such a wonderful addition to our family. He still chews anything he can get hold of but that's getting better everyday. I have attached some pictures of his favorite thing to do - SWIM. This is the first Golden we have had that LOVES to swim. He loves it so much we went out and got a new set of steps just for him so he could get in and out of the pool without being lifted. 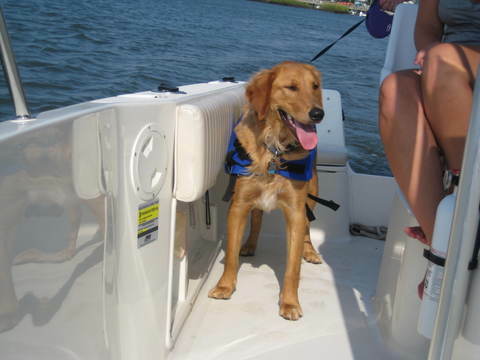 We also got him a doggie life jacket because he would swim until exhaustion. He is too funny. We just love him so much. I can't believe he is going to be 1 year old in 11 days. Where does the time go? Happy almost 1st Birthday Benjamin!!!! May you have many, many more. Wowee..we are having so much fun!!! The cats are finally accepting Bella. She does not want anything to do with them�they were the ones that were a �little pushy. 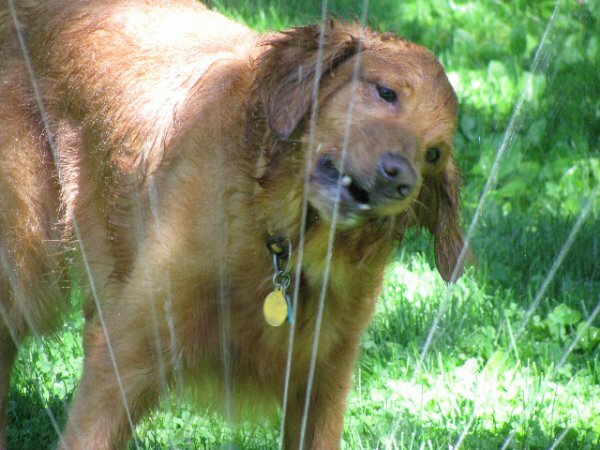 Bella took a small dip in my friend�s pool today playing with her young flat coated retriever and then let me give her a shower in an outside shower with the stream of water coming from above�.couldn�t believe that she loved having her face in the water like that. We had to give her a shower because she had quite the fun rolling with the other dog in the mud!! She watched jenny play tennis today in the car with me for an hour with the air conditioning on and sat in the front seat like a spectator. We both took a nap on the couch this afternoon. Jenny�s girlfriends came over early this morning with a cake shaped like a dog for us to have for breakfast�not Bella, of course, she had your yummy rice and beef. 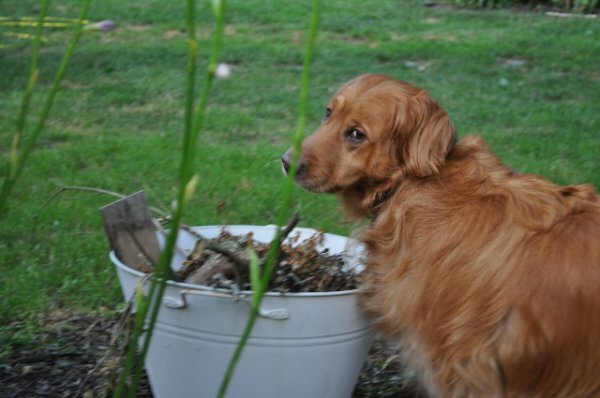 I can�t tell you how PERFECT Bella is for our family�her inside manners are unbelievable. We are still going to crate her at night and if no one is home for a bit because of the cats getting accustomed to her. I only have to get some training on leash manners because of her exuberance and my poor leash skills. THANK YOU SOOOOOOO much for being patient with my questions and helping me to have the confidence to meet and greet this wonderful little girl. It was a pleasure meeting you and Bella thanks you for rescuing her and giving her confidence to join a new family!!! LOL�we�re so glad you trusted our judgement that Bella was the right addition to your family! I want to thank all of you for the e-mails, the cards, the phone calls and the outpouring of sympathy (and empathy) during the worst week of my life. I still cannot believe they both went on one weekend. All the anticipatory grief is worthless and the pain hits you just as hard when it happens. We all know someone (my mother) who says "Geez-the dog died two days ago. Why are you still crying?" But getting support from those around you who know and understand exactly what you are going through is priceless and is the only thing that helps to make the grief bearable. Jack and Daisy played a large part in my fostering experience. Belle wouldn't get up unless Jack was there and led her outside. 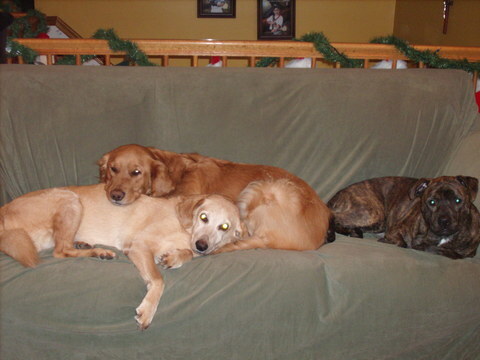 And Daisy always made sure that the foster children knew their place. One of my fondest memories of Daisy was when Comet met all three for the first time. Comet humped Jack (as they all did) first, tried to hump Harry, who snarled at him and told him to go away and after three more failed attempts at Harry, Comet turned and headed toward Daisy. Daisy raised one eyebrow and Comet made a U-turn mid stride and headed back toward Jack. One eyebrow lift was enough-Daisy was special in so many ways. Someone made the comment that the Rainbow Bridge is a different place now that Daisy has arrived. A past member of GRRI was with me the day after Jack died and said GRRI will be there to support you. You can count on them, and he was absolutely right. So I thank you all and am very grateful that you were all there for me during this saddest of times. Here are Jack and Daisy last Spring. Judy, nobody should have to go through what you did over those couple of days. It�s bad enough to lose one; to lose two days apart is totally unbearable. Anyone who has ever opened their hearts to allow these wonderful animals in can feel your pain. Our heartfelt sympathy. So this is not going to be a good day. It is with a terrible hole in my heart that I have to tell you that we helped Marcus to the Bridge this morning. He has been slowly deteriorating over the past several months, and last week we could see him just slipping away. This past weekend he had a complete kidney failure and at the vet this morning, we decided that the kindest thing we could do for him was to let him go. Although we only had Marcus for two and a half years, they were wonderful years, and we enjoyed every minute with him. We miss him so much! I told him to find Daisy and Jack and to keep them company until those who love them best can finally join them. I know that he is young again now, free from pain and able to run and play the way all dogs should. Thank you GRRI for allowing this wonderful boy into our lives. Godspeed sweet Marcus. We will love you forever. Anne & Rich, we�re so sorry to hear about Marcus. He was the sweetest, kindest guy. His face would just melt your heart when you looked at it. He�ll remain with you both in your hearts. My name is Terry Gambino and my husband Larry wrote to you about attending the reunion for our very 1st time, unfortunately, he sent it to the wrong e-mail address. We would like to attend and bring our son, Spanky, whom we adopted from GRRI-NJ, and is now living day to day. You see, he had a brother, Savyer, our little boy who passed a week ago Thursday, from brain cancer just 3 weeks after our knowing of this dreadful news. Savyer, being the younger brother, gave Spanky life...usually a younger dog will follow an older dogs lead...not in our case. Ever since we united both boys years ago, Spanky did whatever Savyer did...and naturally, since Savyer's passing, Spanky is brokenhearted (as we) and can barely stand for long and suffers from much! We adore him and have since the day we brought him home and we just want the rest of his life to be as happy as can be...we were told that we could still have him to love for one month or one year...no one knows...so, if it isn't too late, we would love to attend with some regret, that we didn't ever get the chance to do this earlier, as most of the reunions were on Saturdays and I work on Saturdays. Sorry to go on...had a bad night of crying over Savyer and when I saw the failed mail alerts in Larry's inbox, wanted to reach out to you ASAP...hoping to hear from you soon! Terry and Larry, our sincere condolences on Savyer�s passing. Of course it�s not too late to RSVP to attend our reunion. We know how upset you must be, first by losing Savyer so quickly after learning of his diagnosis, and now having to live day by day with Spanky�s illness. We�re looking forward to seeing all three of you on October 3rd. I have to apologize for not RSVP-ing before the 15th, but I had spoken to Linda Walter and let her know that we were coming, and don't know if she passed the info on. We have been very preoccupied with Bernie's health. On Sept. 15th, Bernie (formerly Bruno) had surgery to remove a mast cell tumor and as you can imagine, we have been worried sick since his biopsy a week before that. We still are worried as we don't have the lab report back yet and don't know what stage we are dealing with. Perhaps tomorrow we might hear something. Whatever the outcome, Bernie will be in the Parade of Rescue Dogs with great enthusiasm and sporting both of his proud forever parents along with a new scar. This is one fabulous dog that we love so very much. We did hear about Bernie's pathology report about an hour ago. It was good news. It was a Grade 2 and all margins were clear so we equate that to a Stage 1, grade 2. Our vet was consulting with the oncologist at Garden State, so we feel more confident. No further treatment will be necessary, hurray!!! Thank you so very much for the prayers and loving thoughts. Hurray is right! Wonderful news. Looking forward to seeing you at the reunion. Just wanted to send some updated pictures of Benjamin. He loves the Beach and Boat Rides. Tom finally has the Boating dog he has been longing for. Benjamin is the BEST!! He is very well behaved in the car for the ride down the shore and he just loves everything there is to do there. We can't imagine life without Benjamin!! Looks like Benjamin is right at home being the co-pilot on the boat! 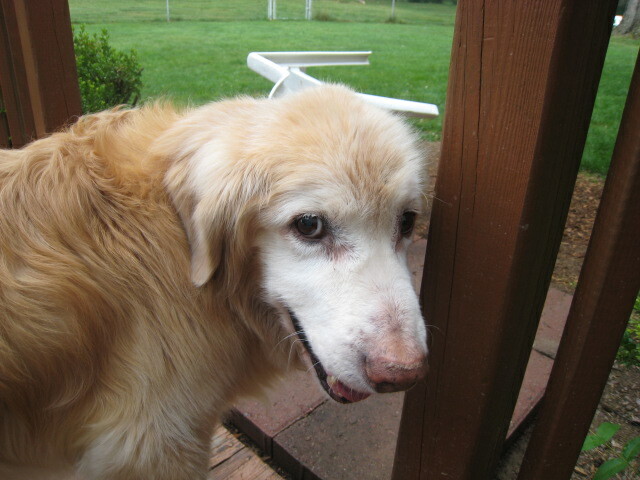 With tears streaming down my face, I'm writing to say that with broken hearts and a lot of love, Drew and I helped our 17-yr-old Golden/Lab mix, Casey to the bridge. He had just celebrated his 17th birthday in June. Casey was our 'gentleman", not one of "the boys". He had such a gentle demeanor; he wasn't an in your face type of dog. He was very content to sit by our side and get petted; to go for a ride or a walk; or to just hang out in the yard. And boy did he love his treats. And second to treats was his love of his rubber ring. He would chase that ring every day and carry it around in his mouth. Casey loved everybody. Our darling boy, we miss you already. You will always be with us in our hearts. I know God will take good care of you for us until we are all reunited. Note: Casey was one of the handful of mixes that we brought into rescue because of his living conditions. His elderly owner had to move in with her daughter but Casey wasn�t allowed to go with her; he was kept gated in the kitchen for 3 months before the family called us to take him. Her grand daughter would go over once a day to feed him and let him out. How life changed for him after that. Following is a tribute written by George Leifert in memory of his GRRI Golden, Hunter who recently died of lymphoma. �Hunter, it is so very hard to put into words what you have meant to me these last 10 years. You were a bit of a sad case when you were rescued the day you were to be put down at that shelter in Ocean county NJ. Skinny, blind in one eye, and a horrible coat. When I saw your picture I saw something special in that face and I was never disappointed. You filled out that large frame and became a 90 pound boy with a coat that always got you compliments. You were a bundle of energy and love that just needed a chance and I will be thankful forever for taking that chance. You saw me through a divorce, gall bladder surgery and a hip replacement. I remember how we sat on the deck of that little cottage in Kent CT and you answered the Coyotes at night. You were tireless and we walked for hours through that lovely countryside. But there was more to come. We moved to upstate NY into a large historic house and your face told me that you were really home. You explored and enjoyed all the little nooks of an old house. The large fenced yard gave you a new freedom and you enjoyed the four seasons in your new domain. Our walks were now around the village and you met and greeted everyone as we walked. A few people know my name but everyone knew you and you always stopped to get a scratch behind the ears or a little back rub. We met a lady who lives nearby who always took off her gloves and pocketed them so you wouldn�t take them. Everyone would marvel at how you carried your folded leash in your mouth and walked next to me totally focused. We�d visit garage sales and you always managed to steal a stuffed toy that I had to pay for. You�d proudly carry home your prize. George, thank you for seeing past his physical self and seeing the wonderful dog that was hidden inside. Our deepest condolences. 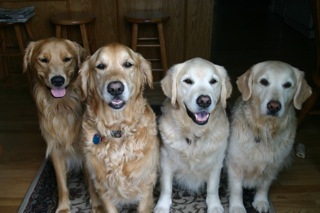 rescue as any of our Goldens. Luke and Sophie grew up together, and Sophie taught our jumbo-jet, sweet Luke all about being a Golden in black fur. most likely culprit. We are devastated. This is so unfair, but we are trying the best we can to accept Luke's death and move on. journey to the Bridge may be as smooth and peaceful as his sweet soul was here on earth. We were saddened to hear of Luke�s sudden passing. Our prayers are with you. He was a beautiful boy. 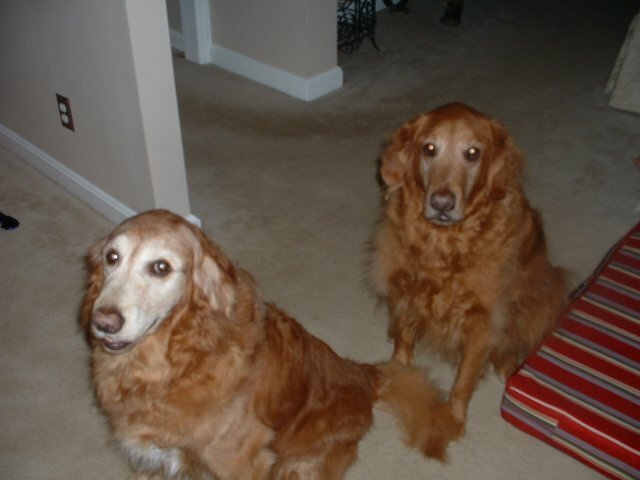 Sorry we are unable to attend the reunion, but Abby & Maddie will be thinking of all their golden friends. Please accept this donation as our continued thanks for your wonderful work! Thank you for your generous donation. Hugs and kisses to the girls! Hope all is well with you. Apollo is just wonderful. He is the sweetest and most affectionate dog. We love him so much and cannot imagine our life without him. When I saw this poem, I imagine it is what he would say. I will never know the loneliness I hear in the barks of the other dogs �out there�. I can sleep soundly, assured that when I wake, my world will not have changed. I will never know hunger, or the fear of not knowing if I�ll eat. I will feel the sun�s heat, and the rain�s coolness, and be allowed to smell all that can reach my nose. I will be talked to and, even if I don�t understand, I can enjoy the warmth of the words. I will never be used to improve peoples� images of themselves. I will be loved because I am who I am, not someone�s idea of who I should be. I will never suffer for someone�s anger, impatience, or stupidity. I can trust arms that hold, hands that touch�knowing that, no matter what they do, they do it for the good of me. If I am ill, I will be doctored. If scared, I will be calmed. If sad, I will be cheered. No matter what I look like, I will be considered beautiful and known to be of value. I will belong, I will be home. Thank you for sharing this with us, Linda. It�s such an emotional �tissue alert� poem, but one that can apply to so many of the dogs we accept into our rescue. This donation is in memory of our beloved Hugo. For our Hugo, we hurt as we do because you gave us so much. We will always, always love you. Thank you so much for your generous donation in memory of Hugo. Although he�s gone, he will live forever in your hearts. Our golden Rocky means the world to us. We think what you are doing is very noble. In honor of our upcoming wedding, we wanted to make a contribution to your efforts. How generous of you to make a contribution to GRRI in honor of your wedding! We wish you and Rocky all the best! Please accept this donation in celebration of Pat DeSarno's birthday. 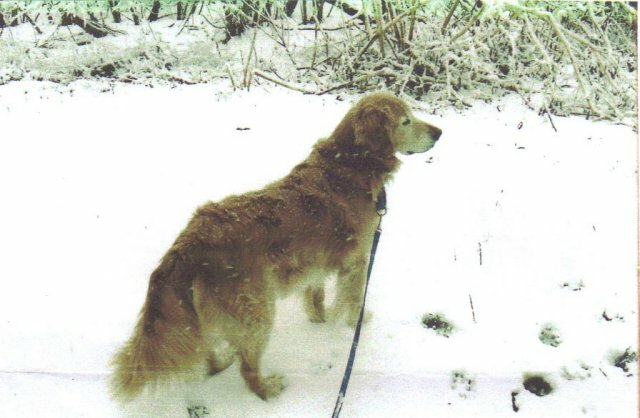 I know her endless dedication and her love for rescue have made it possible to give so many goldens their dignity back and a chance to live their lives in safe and wonderful homes. GRRI has given my husband and I the greatest gift. We could never imagine our lives without our Crystal. So happy birthday dear Pat. Thank you from the bottom of our hearts. We love you and Rescue. Thank you for your donation in honor of Pat�s birthday. 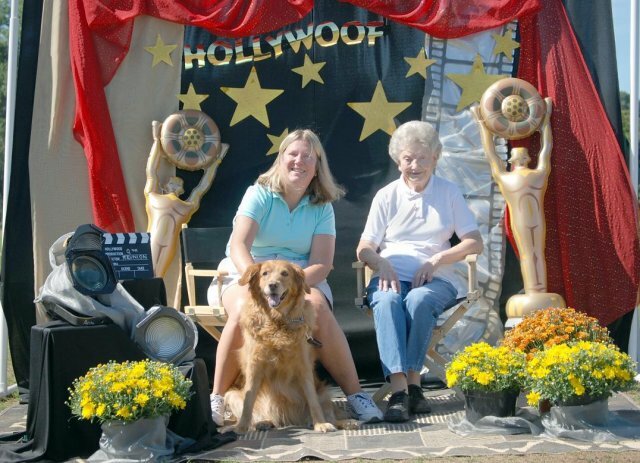 We couldn�t agree more � she is a wonderful person and her dedication to our goldens is certainly worthy of this beautiful tribute!